Holds 12 regular size 2-5/8 oz cupcakes. Fits our 14x10x4" Bakery Boxes BBCH14104, BBPKW14104, BBPK14104 & BBWH1063. Complies with FDA regulations for food packaging. Made in the USA. 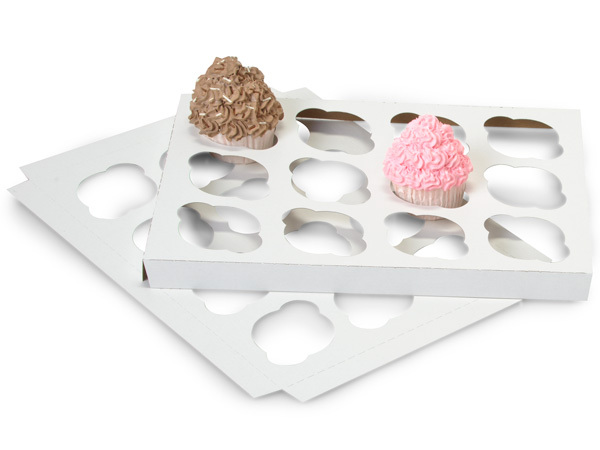 100% Recycled Cupcake holder inserts will keep your treats safe during loading and travel. Cupcake inserts are white clay coat on one side and kraft on the other for a great match to your application. Cupcake holders have finger notches cut in each insert to make placement and removal of cupcakes easy. Complies with FDA regulations for food packaging. Made in the USA. Cupcake Inserts fit into our Bakery Boxes.